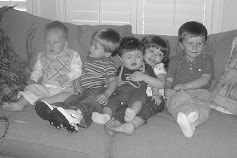 Oh, tell me, please tell me, is there a trick to get cousins to sit still, even real quick? One giggles, one wiggles, one tugs on another. One crawls, one tickles, then they pile on each other. At the end of the day, when all's said and done, taking pictures with cousins, is way too much fun! As if our family wasn't blessed enough...meet our newest member...JACKSON! 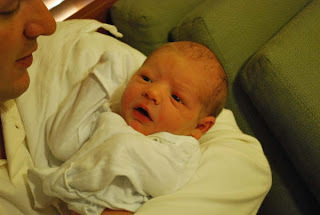 Baby Jackson joined the family on Monday, Oct 6th weighing in at 8lbs 11oz, and 21 inches long! 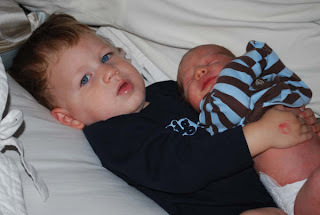 Joey is doing GREAT as a Big Brother! 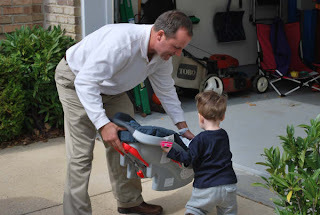 He even helped to carry him into the house for 1st time! As you can tell it has been a while since we've been on here, so stay tuned for a brief summary of the remainder of our summer. To start we had two AWESOME birthdays. Austin Allen Hoffman turned 1 years old and we had a great party with family and friends at the Cooper house and lots of pool time. Mommy also go Austin's 1yr pictures taken..which will follow this blog with all the other pics to catch up on. Trevor Harvey also had a birthday and he turned the big 3! His mommy had a great party for him at a local Frisco Firehouse...again with lots of family and friends. Then for some reason Anna & I though it would be a great idea to take to kids to the Circus...I mean really, we are the circus...LOL! But in all honesty the kids were great and thanks to our wonderful Uncle John Krivacic in California, we scored some wicked seats. So as you can see August and September we very busy..but October is going to be even better. Madison is having her 4th birthday the 25th and it will be a Halloween party, so stay tuned for those pics. Also the family has a new arrival coming Tuesday October 7th, if he doesn't come on his own before then. Joey Hortiz and parents are waiting on the arrival of Jackson Hortiz, little brother due any day now....SERIOUSLY! Again...sorry for the time lapse between blogs it has been a busy summer. Wishing everyone a great fall and GO COWBOYS! So we had one big family 4th of July!! We spent the afternoon at Gerry & Cotton's house swimming and of course eating! See our pics below! Joe, Jennifer, and Joey came to town for 2 weeks. It was great to see everyone and the kids had a blast together! So we had 5 kids under the age of 4, and 4 dogs, and boat loads of adults! All together there are 18 people, and 4 fur babies! WOW! It was rockin and rollin! Hope you enjoy our pictures!! Hopefully we'll get Jennifer's on here soon, because she got some good shots! We are cousins! There are 9 adults, 6 kids, and 4 dogs! In one word...craziness!! This blog is to update our families on the happenings in our lives! We are planning a wedding, waiting for the holidays and just being Mommys! Enjoy!